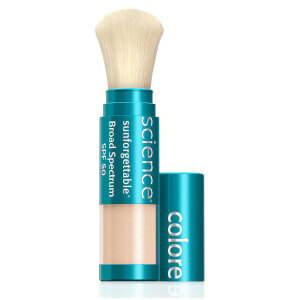 Protect and perfect your skin with Colorescience Pro Sunforgettable Mineral Sun Protection Brush SPF 50, a 2-in-1 mineral sunscreen and finishing powder that can be worn alone or over makeup. With an easy-to-use brush delivery system, the mineral powder formula harnesses the protective properties of broad spectrum SPF 50 for ultimate sun protection, and delivers a veil of weightless coverage that both protects and perfects the complexion. Free from chemicals and fragrances, it is suitable for all skin types and sexes, and glides onto the skin with crease-free, mess-free results; ideal for makeup touch-ups on-the-go. 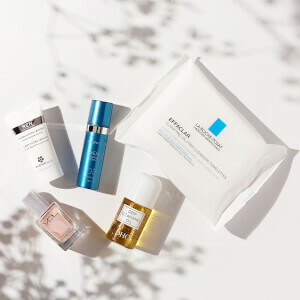 The award-winning sunblock formula is highly coveted by celebrities, and is a unique alternative to traditional sunscreens. Can be used daily to keep skin protected from the sun's damaging UVA/UVB rays. Sweep brush over your skin to release powder. Use small circular strokes to release more powder for more coverage. Apply liberally and evenly all over your face and chest before sun exposure; reapply every two hours throughout the day for continued protection. Apply over Sunforgettable Primer SPF 30 for ultimate protection. Active Ingredients: Titanium 22.5%, Zinc 24.5%. Inactive Ingredients: Bismuth Oxychloride, Calcium, Cilicate, Corallina Officinalis, Dimethicone, Dimethicone/vinyldimethicone Crosspolymer, Iron Oxide, Manganese, Violet, Mica, Titanium Dioxide. I was happy to finally have a portable physical sunscreen that I could apply anytime without disturbing my makeup. It is very hard to see if anything is coming out. As I put it on it actually does ruin my makeup and actually removes my foundation and concealer. I'm packing for an overseas trip and trying to minimize the amount of liquids so I can have a carry on. Since this sunscreen is in powder form, I don't have to worry about running out and it's light and easy to pack! Sometimes it's hard to tell if it is coming out, but if you follow the directions that come with it, then you know you're applying it correctly!